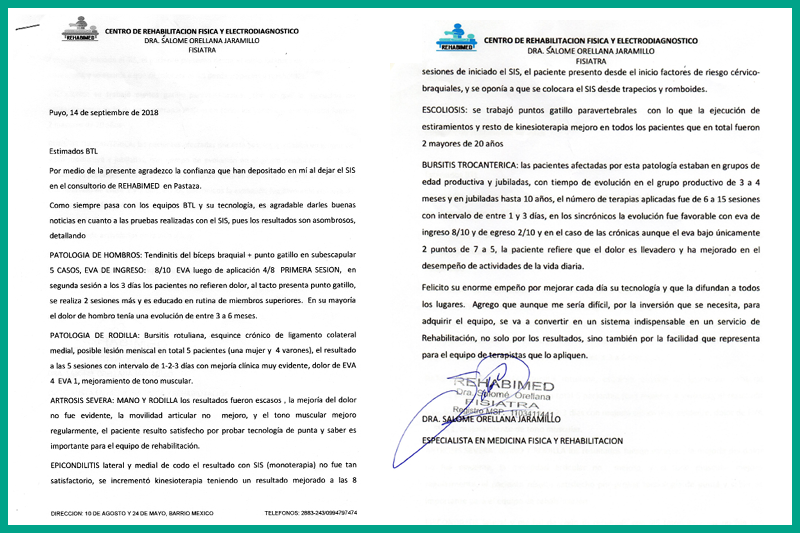 Through this letter, I would like to thank you for entrusting me the Super Inductive System in the Rehabimed clinic in Pastaza, Mexico. As always with BTL equipment and its technology, it is my pleasure to give you good news regarding the demonstration treatments carried out with the SIS, since the results were amazing. SHOULDER PATHOLOGY: 5 patients with Biceps brachii tendinitis received 4 sessions of Super Inductive System. After the first session, VAS decreased from 8/10 to 4/10, before the second application the patient reported no pain but the trigger point was still present, two more sessions were applied. In most cases, the pathology was present for 3 to 6 months. KNEE PATHOLOGY: In 5 patients (1 man, 4 women) with patellar bursitis, chronic sprain of a medial collateral ligament, a suspicion on meniscal injury we observed tangible clinical improvements in pain reduction (VAS from 4 to 1) and muscle tone. All this after 5 sessions in the interval of up to 3 days. SEVERE ARTHROSIS (HAND AND KNEE): In cases of severe hand and knee arthrosis, the muscle tone improved systematically, pain improvement was not so evident but the patient was satisfied to try state-of-the-art technology and such experience is important for the rehabilitation team. LATERAL AND MEDIAL ELBOW EPICONDYLITIS: 8 Super Inductive System sessions in combination with kinesiotherapy improved medial and lateral epicondylitis. 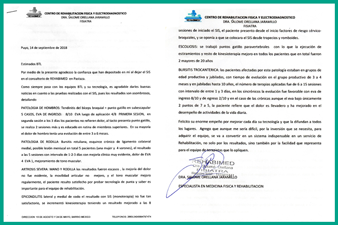 The assessment was done again for the patient who did not respond well to the treatment of epicondylitis and it was identified as a cervical-brachial issue which was further treated. SCOLIOSIS: SIS applied on paravertebral trigger points (2 adult patients), combined with stretching and kinesiotherapy improves adult scoliosis. TROCHANTERIC BURSITIS: 6-15 SIS sessions scheduled 1-3x a week led to trochanteric bursitis chronic pain relief and patients improved performance in daily life activities. I congratulate your enormous effort in improving your technology every day and spreading it everywhere. Moreover, although it is difficult for me because of the investment, the Super Inductive System will become indispensable equipment in our rehabilitation service, not only for the results but also for the ease of applying that therapists like so much.